If you're looking for way to install multiple Cydia Repositories on Non-Jailbroken iPhone, iPad, iPod Touch devices running any version of iOS Firmware, particularly iOS 9.3.x, then Mojo Installer is the only solution. Mojo is app-based Cydia-Like Installer and currently the Best Cydia-Alternative available for iPhone SE, iPhone 6S Plus, iPhone 6S, iPhone 6 Plus, iPhone 6, iPhone 5S, iPhone 5C, iPhone 5, iPhone 4S, iPod Touch 6, iPod Touch 5, iPad Pro, iPad Mini 4, iPad Mini 3, iPad Mini 2, iPad Mini, iPad Air 4, iPad Air 3, iPad Air 2, iPad Air and iPad 2. 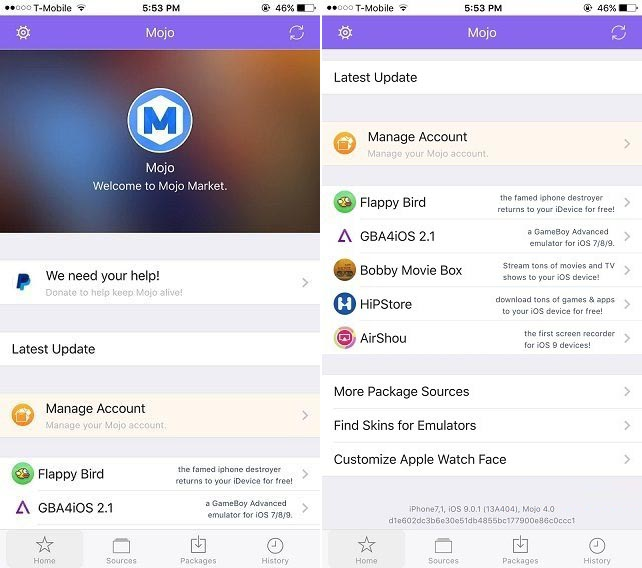 Apple iDevice users can Install Mojo on iOS Firmware Without Jailbreak, and it will accept Cydia tweaks and apps repositories and packages including game emulators and screen recorders without any problem. 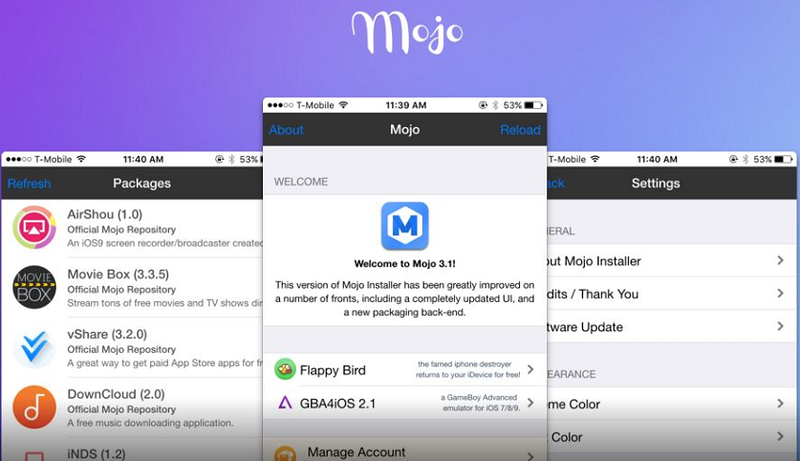 Below you can read and follow our detailed Guide and Tutorial to Download and Install Mojo Installer on iOS Without Jailbreak on Non-Jailbroken iPhone, iPad and iPod Touch devices. Make sure to disable all passcode / password / Find My iPhone / Touch ID codes. Step # 2: The official Mojo Installer page will open. Now click on big blue button in middle says "Install directly from your iDevice"
Step # 3: On next page, read whole instructions before tapping on button says "Build Custom Profile"
Step # 4: Now, native settings app will open, at top-right side tap on "Install" button to start installation. Step # 5: After that, you will see your device UDID, model and firmware details, after confirmation just tap on "Install Mojo" button to initiate process. Step # 6: Now, you will get a new Install Profile and Warning page, just click on "Install" button appearing at top-right corner. Step # 7: Mojo will be installed now, and its icon appears on home screen. You can tap it and start adding repos, install jailbreak apps and emulators for FREE. Note: To uninstall or remove Mojo app installer, Just navigate to Profile section >> Mojo Installer Profile >> Delete Profile.